Why should I care about evasive plants or Milfoil? We urge you to watch a video of the work that is being done on a small lake in Minnesota that is infested with Eurasion Water Milfoil. You will see the harvesters that bring up tons of this invasive plant each year. Minessota has over 250 lakes with the Eurasion Water Milfoil. This video helps us all to understand why it is so important to protect Moose Pond from invasive water plants. CLICK HERE TO WATCH IT TODAY! Do you have a camp road or Road Association? Click here for a free brochure on maintenance advice. How close is invasive milfoil to Moose Pond? Click here to see photos of Milfoil. 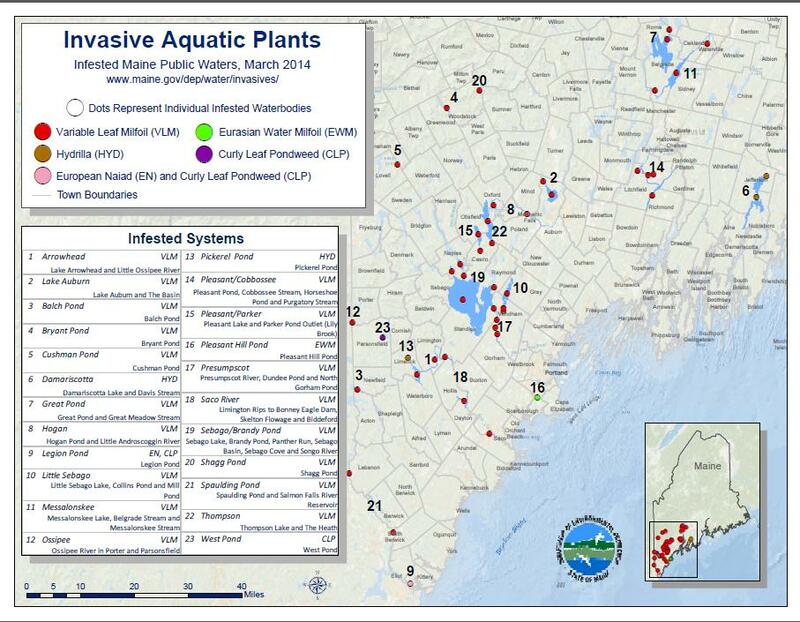 Click here to see a map of infested lakes in Maine. Who should I contact if I find a questionable plant? Err on the side of caution. If you find a milfoil, consider it a suspicious plant, collect a specimen, and submit it for identification as directed. Contact the Maine Volunteer Lake Monitoring Program at 207-783-7733 or vlmp@mainevlmp.org for further instruction or additional information. Didn't Find Answer? Submit Your Question.